Fine Gael gains outside of Dublin. 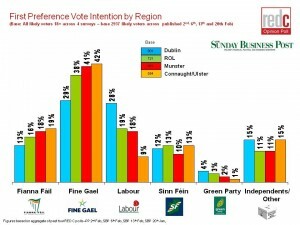 A regional update of the polls, including the latest poll published on the 20th February, suggest that gains for Fine Gael are coming from outside Dublin. 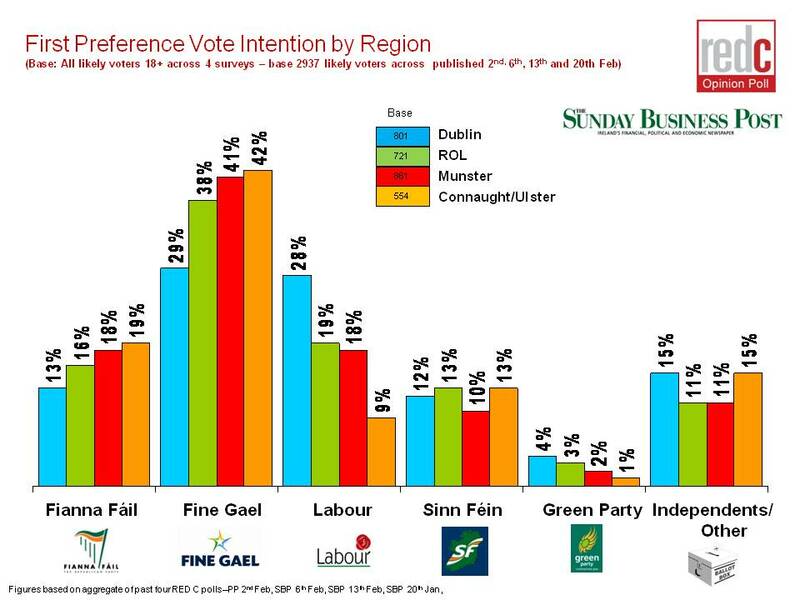 The party sees support rise in both the Rest of Leinster by 2% and Munster by 3% in the four poll analysis. In Dublin however the party remains static with no improvements seen. This also means that Labour continues to hold pretty good support in Dublin, and has not fallen back here significantly. Instead the declines for Labour appear to be more seen in Connaught and Ulster, where historically they have had a weaker presence. But also in the Rest of Leinster outside of Dublin, where the latest polls sees a real drop for the party. Fianna Fail lose out a little in the Rest of Leinster, with Sinn Fein making some gains here. But on the other hand they make small improvements in Dublin and Connaught/Ulster. Sinn Fein fall back in Munster but make up for this with gains in Leinster, while the green party improve slightly in Dublin where they have the best chance of retaining a seat.